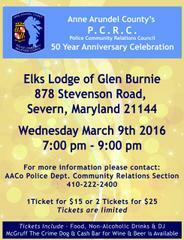 Community: The PCRC 50th Anniversary will be celebrated at the Glen Burnie Elks Lodge on March 9, 2016 at 7:00 pm. Please join other community leaders to celebrate this great organization. 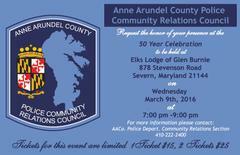 All Four (4) Anne Arundel County district councils will be attending. Invitations are open to the public, RSVP soon because there is limited seating capacity at the venue.